Executives in the failed USA Bank are being investigated by the Federal Deposit Insurance Corp., after investors alleged fraud and lending abuses. The investigation includes staff from the FDIC’s Office of the Inspector General, which can refer its findings to the FBI for criminal prosecutions. At the center of the investigation is a father-son team from Greenwich, Conn., who founded the bank: Fred DeCaro Jr. and Fred DeCaro III. A director of the bank began complaining to regulators about DeCaro Jr. and some of the bank’s board members in late 2006, within the first year of the bank’s formation. Meanwhile, DeCaro Jr. was providing millions of dollars in construction loans to founding investor and real estate developer Ruth Jones. Jones says she helped raise over $3 million for the bank and that she and her family invested nearly $1 million in USA Bank themselves. Jones eventually received 27 loans on 12 properties, including second and third loans. She filed for Chapter 11 bankruptcy protection in 2009. Jones says that her name was forged on lending documents with USA Bank and that she had been unaware of some of the loans taken out in her name. In a signed, notarized letter that Jones made available, it appears that DeCaro Jr. acknowledged that one of his staff forged Jones’ name. The staff member was fired, according to the letter. Jones said she believed that the staffer was directed by DeCaro to forge her name. She has shared these details with FDIC inspector Bill Mitchell and with Mike Rexrode, a special agent from the FDIC’s Office of the Inspector General. Additionally, Jones said that she learned in 2007 that USA Bank had paid $500,000 of a $1.4 million construction loan she had taken out to a subcontractor without her permission. The contractor, Joe Tomonto, was related to DeCaro Jr., Jones says. Tomonto had also walked off of a landscaping job that Jones had hired him for after Jones complained about the quality of his work. Emails that Jones says she sent to USA Bank show that she instructed the bank not to drawn down on the loan to pay Tomonto, but when she went to get more money later to pay other contractors, she learned that Tomonto had been paid without her permission. Jones says she notified board and loan committee member Jim Verrillo, who had also acted as her escrow agent for closing her loans. She says that Verrillo told her that he’d look into the matter, but never got back to her. 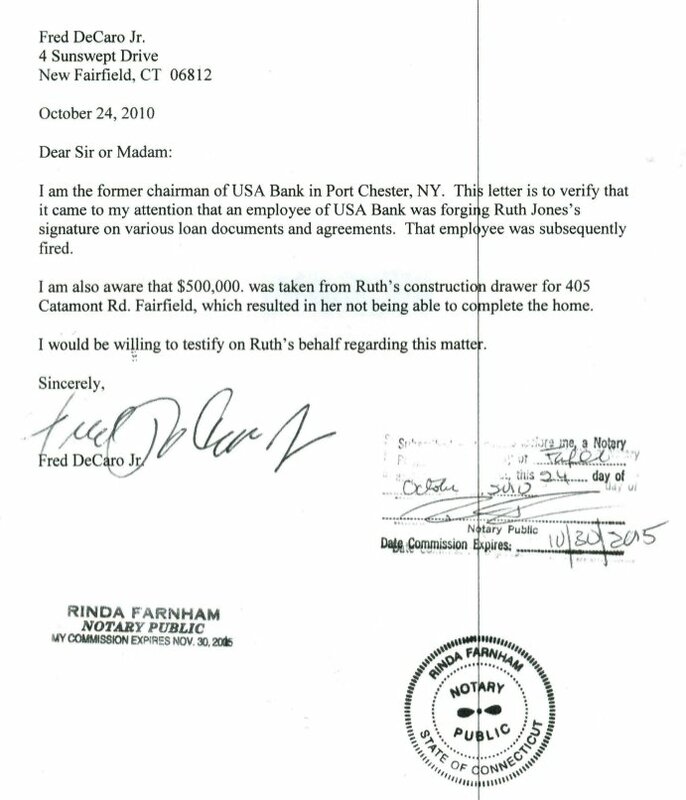 Jones says she was interviewed about USA Bank by the FDIC investigator Mitchell last August. Below is an image of the one-page letter from DeCaro validating some of the improper activities; for the original pdf click here. CTWatchdog.com also has an article on the USA Bank affair. Update, 2011-05-31: Teri Buhl has posted a follow up article on her blog entitled Former Bank President was Afraid to Whistleblow on USA Bank’s DeCaro.